While I am away visiting my parents in Malaysia, I have asked a couple of friends to guest post for me. Today, we have Hyosun of Eating and Living with this delicious and tasty East meets West Korean Style Tacos. When I first came across Hyosun’s elegant blog Eating and Living sometime back, I was immediately impressed. I enjoy Korean food for its spicy and strong flavors and Hyosun’s very refined and exquisitely presented food kept me going back for more. Her meticulous attention to detail makes the recipes easy to follow and replicate. She also has an amiable writing style that welcomes one into her virtual kitchen. I know you will enjoy her blog as much as I do. Hyosun is a Korean-American mom of two grown-up children living in the Washington, D.C. area. 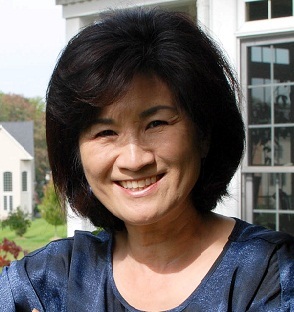 She works full time for the U.S. Government and blogs about authentic Korean cuisine during her free time. Hyosun started her blog to teach her two grown-up children how to recreate the recipes they grew up with. Since then, it has become the go-to site for delicious easy-to-follow recipes on classic Korean cuisine. Bibimbap is one of the most popular Korean dishes outside Korea and has been getting a lot of attention recently in the U.S. The cooking process can be overwhelming since it involves preparing a number of small dishes that are put together at the end. In her recipe, she laid out each step with a photo and made it easy to follow along. Mandu is a Korean dumpling stuffed with a mixture of various meat and vegetables. There are many variations. Although it does take some time to make them, home-made mandu is always well worth the effort. I hope you will visit Hyosun soon. Do check out her many delicious Korean recipes and please say “Hi” for me. Hyosun is a regular contributor to The Daily Meal. You can also find her on Facebook. Hi! I’m Hyosun from eating and living, the Korean home cooking blog. Through my blog, I share the secrets of classic Korean home cooking. It’s my great pleasure to guest post here today while Biren’s visiting her parents in Malaysia. I’ve been a big fan of Biren’s blog for quite some time, and it truly is an honor for me to be here today. Biren asked if I could share a Korean beef recipe. After some thinking, I decided to share Korean-style tacos made with my signature galbi recipe (Korean BBQ short ribs). The recipe has two parts. First, I’ll show you how to make authentic Korean BBQ short ribs. The recipe will be great for your summer grilling. Then, I’ll turn the deep flavored short ribs into my version of a popular Korean/Mexican fusion dish. The word galbi (also spelled kalbi) literally means “ribs”, and the full name of BBQ galbi is galbi gui (grilled). It is THE most popular backyard/outdoor BBQ dish in Korean homes. Short ribs are a tough cut of meat and need to be tenderized for grilling. Traditionally, grated Korean pear is used as a tenderizer. The pear also adds a subtle fruity sweetness to the marinade. Grated onion and alcohol in the marinade also tenderize the meat. The short ribs need to be marinated for at least 6 hours or longer (overnight for best results). Plan accordingly. The result is tender meat that has a smooth balance of sweet and savory flavors. As you might know, Korean-style tacos were made famous by a food truck (Kogi – Korean BBQ-To-Go) in Los Angeles over 3 years ago. Since then, food trucks selling Korean tacos have become a nation-wide trend. Unfortunately, I’ve never had tacos from “Kogi” truck, but the idea is to place Korean BBQ meat on a Mexican corn tortilla topped with a mix of Korean and Mexican flavors. In my version, I paired the meat with a refreshing salsa made with kimchi, Korean pear and other crunchy vegetables. I used good amounts of cilantro and lime juice to incorporate Mexican flavors. I also created a gochujang (Korean red chili paste) sauce to give the tacos extra heat. 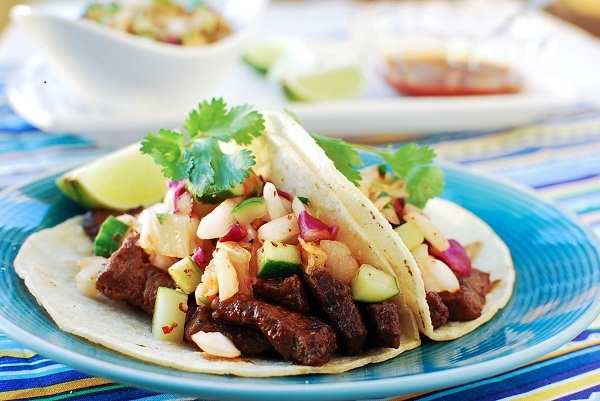 There you have it – delicious Korean-style tacos! Thank you Hyosun for a most delicious recipe and informative post. I hope I will get a chance to try out your recipe soon. Korean beef dishes are always great, and this one looks like a winner! What fabulous way to eat Korean food….tasting all great flavors in each bite! Lovely post, Hyosun! Great to meet you, Biren! Thanks, Kay! Great to see you here. Ooooweee this looks divine! I am a sucker for Korean Food and this looks so appetizing! I can’t wait to try! I just had quesadilla for dinner last night! Wish I could sample some of these delicious tacos of yours, looks delicious! Hi Hyosun, what a wonderfully detailed tutorial! Never had tacos before, but I would love to start here! Your tacos look gorgeous and so delicious! Thank you, Denise! You’re awesome! Thank you, Ramona! Hope you get to try it one day. A tasty fusion of Korean and Mexican! Love the ribs, the marinade, the sauce, everything about this recipe! What great tacos! It was very nice to meet you and now I need to go check out your blog. Thank you! It’s very nice to meet you as well. This is really mouthwatering! It would be great to go with some steamed buns too. Biren – Thank you for inviting me over to your wonderful blog and for all of your kind words. It’s truly an honor for me. I had lots of fun creating this recipe for your readers. I’ve been enjoying your trip photos on your Facebook. It looks like you’re having a great time with your parents. It is my pleasure Hyosun. Thank you for your lovely post. I am sure my readers enjoy it very much. Hi Hyosun, thanks for introducing this lovely Korean beef dish on Biren’s blog! Kimchi is about the only Korean “side dish” I know. Terrible, eh 🙁 I’ll definitely check out your blog to get more ideas about Korean dishes. This snack will be a winner at parties, I’m sure. Love hassle-free dishes, but there’re are some ingredients that I’ve not heard or used before, eg gochujang. What would be the substitute? Also, I’m not sure I’ve seen Asian/ Korean pears in our local supermarkets (in Belgium). Once again, thanks! Oh wow, this sounds really delicious. I just started up some Korean cuisines lately and this came in perfect. Thanks so much for sharing. p/s Enjoy your trip, Biren. Bon Voyage! Biren, I hope you are having an awesome time with your family and friends! Hyosun, thank you for the recipe. I am forever thankful! We can make great Korean taco at home now! I love that large chunks of meat in that taco! Have to learn to cook some korean food! It looks delicious! Nice recipe! 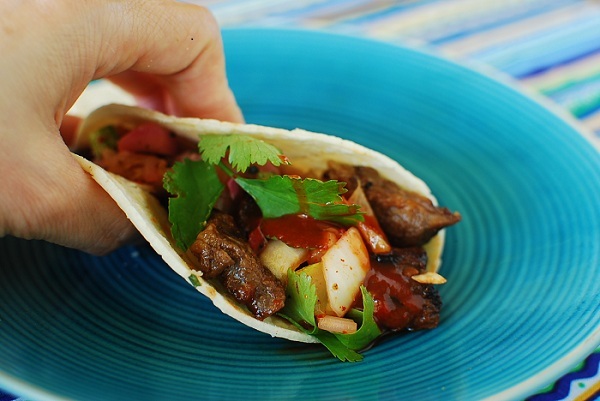 The meat looks incredibly tasty, and I love the idea of using it to make tacos. Really very nice – thanks.